This map shows the most recent parcel, highlighted in red, that the St. Regis Mohawk Tribe has asked the U.S. government to add to their reservation. AKWESASNE -- The St. Regis Mohawk Tribe is asking the federal government to place a third parcel of land into trust, which would make it reservation land. The tribe wants jurisdiction over a 140-acre parcel in the so-called “Hogansburg Triangle” or “Bombay Triangle,” an area where the tribe has been litigating a land claim for years. Under the land-in-trust process, this property would become part of the reservation and under tribal control, exempt from state taxes and regulations. A news release from the tribe says they want the land for a solar power initiative. “The Akwesasne Housing Authority’s Go Solar initiative is exactly the type of clean energy project we need to be spear-heading, not only in our community, but in our region,” Chief Ron LaFrance said in the prepared statement. In January, the tribe petitioned the government to add two other nearby parcels to the reservation for “tribal programs.” More information about that is at goo.gl/SQMwkK. 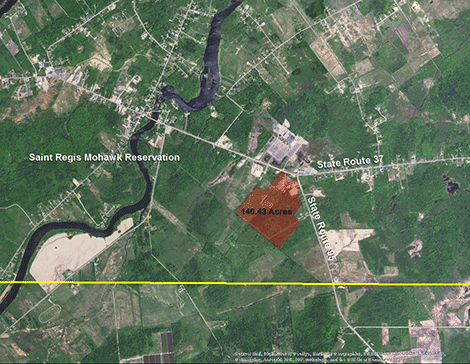 One is 63.5-acre area is in the Town of Bombay, nearly adjacent to, but not within the land claim area. A 15-acre property is not within a land claim area, but it is within a proposed land claim settlement area in Brasher. The land is identified in a 2014 memorandum of understanding between the tribe and St. Lawrence County, the tribe said. “The parcel in Franklin County is a 63.5-acre parcel of vacant land. The St. Lawrence County parcel is a 15-acre parcel that has two structures, a house and a guest house that we will use for tribal programs,” LaFrance said in a prepared statement in January.